Curant is a social network with a commitment to privacy. It empowers users to connect with those they care about by putting them in control of their data and the content they see. I designed a full app mockup for Curant as a personal project. Curant began as an exploration of ways technology can empower individuals to become more connected. Through preliminary research, I discovered a wealth of research and news on how social media can negatively impact people's well-being and sense of belonging. For example, in this TechCrunch article from June 2017 entitled "Facebook is broken", the author argues Facebook no longer connects people together: "Over time, a service which was supposed to connect humanity is actually partitioning us into fractal disconnected bubbles." With Curant, I sought to envision how a social network might look and work if it were not reliant on data collection or targeted advertising for revenue. That is, my goal with Curant was to design a social network that, at its core, works in the best interest of its users, helping them foster personal connections and communities. Over the course of several months, I began building out the concept for the social network, culminating in high-fidelity mockups for Curant's mobile app. Below, I've put together a selection of features from the app followed by an examination of my design process. At this time, I do not plan to publish the complete set of app mockups, but if you're interested in learning more about the project, please feel free to contact me! Curant empowers users to connect with those they care about by putting them in control of their data and the content they see. If you're like me, when you log into Facebook, you see posts from people you barely know and friends of friends who you've never met, and you're considerate of what you post since you're not sure who will eventually be able to see it. Curant addresses these issues through its group management features. Users categorize their connections into groups, enabling them to easily manage who can see their posts and access the content they care about most. The sections below highlight how these features work in more detail. In Curant, groups are subsets of a users' connection, which only the user can see. The user may add and delete custom groups, organizing their connections in a way that makes sense to them, and then customize the notifications that push through from each group. For example, a user might create one group for their immediate family and set it to push through all updates immediately and another group for acquaintances with no notifications enabled. When posting content, the user selects the groups to send it to, enabling them to confidently post content to specific connections. For each group, the user can also access a corresponding news feed that displays all content posted by members of that group to the user. Initially, users are provided with default groups, but are free to add to or delete them, with the exception of two groups: Requests and Uncategorized. 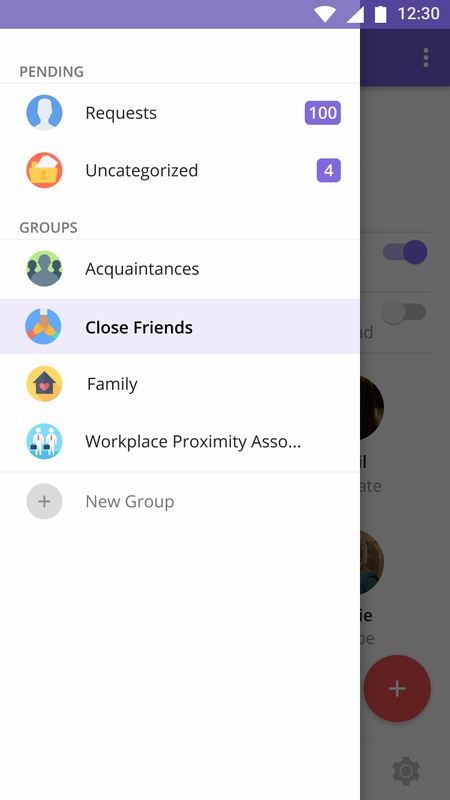 If a user chooses to connect with someone, but does not choose a group to add them to, they are automatically placed in the Uncategorized group. This can be useful, for instance, when connecting with people at a networking event. In this case, the users can quickly connect and are not pressured to choose a group for the person while they're right beside them. The Uncategorized group is also used when a group is deleted; all of the deleted group's members are placed in Uncategorized. Below, you can see the user flow for creating a new group. The user first enters a group name, then chooses an avatar for the group, and finally selects which of their connections will be placed in the group. Before the user can make use of the group features, they must have connections on the network. Therefore, I've designed making connections to be seamless and easy, while also reinforcing Curant's dedication to privacy. For example, the app describes what Curant will do with the user's contacts if they choose to allow the app to access their address book, which includes never contacting others without the user's permission. At the same time, the app also enables users to easily connect with everyone they know, whether they're currently on Curant or not. At the outset, my initial goal was to identify obstacles that deter people from using current technologies to connect with their friends and family. I perused news articles and studies about social media from the past 2-3 years, pinpointing issues that users face, and then organized the articles in notebooks on Evernote. I also interviewed friends and friends of friends about their social media habits and took note of how they currently use social networks. Out of this research, I hypothesized that a potentially strong group of early adopters could be working professionals in their 20s and 30s who have moved at least once after college and care deeply about their privacy. I noted that a significant number of people in this group actively desired better ways to connect with friends and family and were open to trying new platforms. They didn't want to get sucked in and waste time. They had concerns over how their data is collected and used. Among the networks I reviewed, Snapchat was an anomaly. Most users saw it as a replacement or complement to messaging services versus a direct competitor with other social networks, and many users were drawn to it by its privacy (i.e., messages disappear after they're opened). Out of users active on other social networks, many liked that they could could access content on their own time; that is, even if someone posted content, they didn't feel a need to immediately view and respond to it. Reviews of news feeds were mixed: many saw the news feed as a fundamental feature of a social network, but many also noted that they didn't like how easy it was to get sucked into endless scrolling. I took a particularly close look at Google Plus and Path, aiming to pinpoint what might have deterred user adoption. With both, I found the experience, especially navigation, to be confusing and overwhelming. For Curant, I decided to focus the experience on the user's content and connections as much as possible, keeping the design simple and intuitive. My goal with Curant was to create a familiar, but fresh social networking experience. In order to make Curant approachable, I wanted to incorporate core features of today's social networks, including displaying content in a news feed, allowing users to react to others' posts, and providing an easy way for users to add connections. But, I also wanted to provide users with more control over their data and privacy. More specifically, I explored ways to empower users to have more control over what they see in their news feeds and who they share their own content with. I realized both could be accomplished by providing users with an intuitive, effortless way to group together their connections. To start, I listed different ways that a user might organize their connections into groups. I noticed that, with few exceptions, it would be sufficient for users to place each connection in only one group. Network Approach. Any user would be able to create a group and control its membership, including making groups public. While this approach would provide users with flexibility, it would also likely result in users being in groups with people they don't know. Since users would post directly to groups, it also wouldn't be possible for a user to post content to a specific subset of their connections, unless the user ensured each connection had joined a specific group. User Approach. Each user would organize their connections into private groups that only that user could see. This would empower each user to organize their connections in the way that makes the most sense to them. For instance, a user might organize their connections into the following groups: Family, School Friends, Work Friends, and Acquaintances. The user could then access a custom news feed for each of their groups, seeing content from only that subset of their connections. One drawback, however, is that this design would be inefficient for a user who wanted to organize their connections differently for consuming versus posting content. I decided to move forward with the User Approach. However, through testing, I noted that users desired finer control over who they post their content to. In the final version, I included the ability to post content to specific connections, in addition to groups. While I've primarily shown my final, high-fidelity mockups above, my design went through many iterations. I started by sketching and critiquing ideas on paper. Then, once I narrowed in on an initial feature set, I created low-fidelity wireframes in Keynote followed by Sketch, where I analyzed user flows and noted potential design challenges. After numerous rounds of iteration, I created a complete, high-fidelity wireframe that adheres to Google's Material Design principles. While working on Curant, I encountered several interesting design challenges. Below, I've highlighted two of the design challenges I faced and how I addressed them. Early on, I decided to show all content chronologically in news feeds rather than attempting to predict and order content based on its relevance to the user. In this way, users would be less likely to miss posts, since unread content would always be grouped together. However, I then needed to determine whether to order the news feed with the most recent content at the top or bottom. Traditionally, news feeds are ordered with the most recent content shown at top. In this way, on load, the most recent content is immediately visible and it's easy to pull-to-refresh for updates. A big drawback of this layout, however, is that it encourages users to scroll back endlessly through content. Therefore, I considered displaying the most recent content at the bottom of the feed, similar to a messaging app. On load, the news feed would display the oldest unread content, prompting users to scroll down toward the end of the feed. However, I was concerned users might find the layout disorienting since they'd likely be accustomed to the reverse of it. I experimented with different ways to make displaying the most recent content at the bottom more intuitive. For instance, I tried using mail icons and varying the color of posts to indicate unread content, but both indications were too subtle. In the end, I decided to load the news feed to the oldest unread post and use a 'New' bar to help orient the user. Then, rather than using pull-to-update, new posts would automatically appear at the bottom of the feed, similar to a messaging app. If Curant were to allow users to create comment threads on posts, similar to how it works on other social networks, then an element of privacy would be removed. That is, through comments, other users would be able to potentially infer who a user was connected with and how they had grouped their connections. Therefore, I needed to rethink how commenting would work in Curant. Initially, I considered simply allowing direct messaging in place of commenting. However, I noted that this would seem disjointed and tedious: after seeing a post, the user would then need to open a direct message in a separate part of the app. It worked, but it wasn't ideal. I then considered enabling private comment threads on posts, which would be only visible to the poster and commenter. However, since posts are shown in the news feed in chronological order, users would need to go back in their feed to find a post if comments were added to it. I also considered allowing users to quickly jump to or pin a post, but both methods added too much complexity. Eventually, I decided upon a solution that combined elements from both of my previous ideas. For each connection, the user would be able to access a separate feed that displayed all posts and direct messages between the user and that specific connection in chronological order. Then, on each post, the user could click on a reply button that would create a direct message within the personal feed between the two users. It trades off having comments tied directly to posts for a simpler user experience that's more unified. In the future, I'd consider having a way to copy or link to the previous message within the reply.